THE family of a soldier awarded the Victoria Cross for leading a counter-attack, against greatly superior numbers, during a key part of the Battle of the Somme have spoken of their pride after a memorial to honour him was unveiled in his home town. 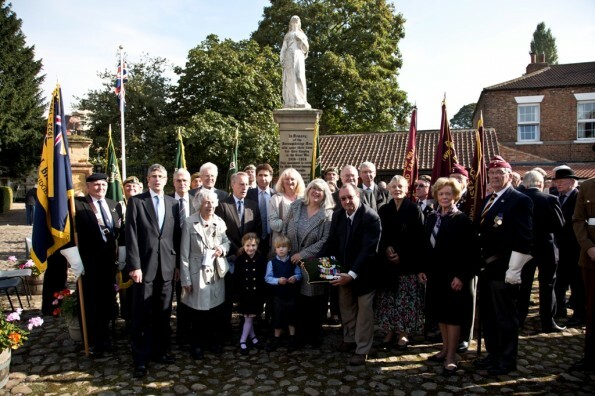 Numerous members of Green Howard soldier Archie White’s family attended a ceremony in Boroughbridge, North Yorkshire, to mark the centenary of his actions to clear Germans from a stronghold, near Thiepval, while commanding troops. Almost 200 people attended the service in Hall Square, including Transport Minister and Harrogate and Knaresborough MP Andrew Jones, the Lord-Lieutenant of North Yorkshire Barry Dodd, members of several regiments of the Armed Forces, schools, civic leaders and the Royal British Legion. 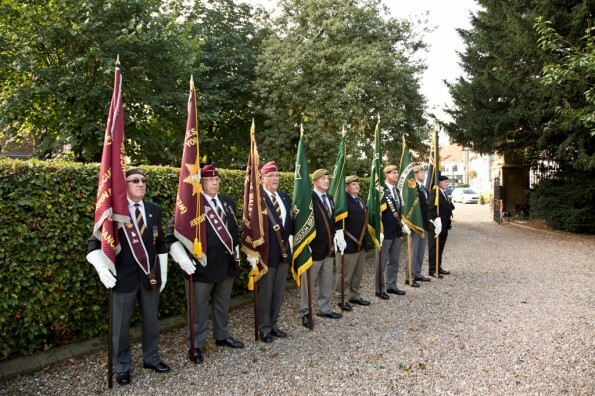 Yorkshire Regiment soldiers sounded the Last Post and lowered the flag before Mr Dodd unveiled a memorial paving stone beside the town’s war memorial. The ceremony also saw Archie White’s Victoria Cross citation read out. It states: “For most conspicuous bravery at Stuff Redoubt on September 27 and October 1, 1916. He was in command of the troops that held the southern and western faces of a redoubt. For four days and nights, by his indomitable spirit, great personal courage and skilful dispositions, he held his position under fire of all kinds and against several counter-attacks. Historians have stated the capture of the heavily fortified area was particularly significant as it was a heavy blow to German morale and exposed a vast area to ground observation. 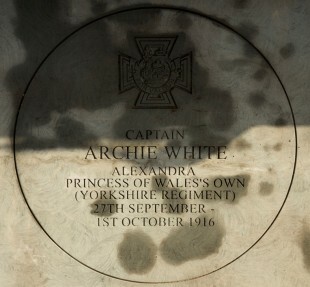 At the time of his actions, Archie White was 25 years old and a captain in the 6th (Service) Battalion, Alexandra, Princess of Wales’s Own (Yorkshire Regiment), later known as the Green Howards. After being commissioned into the regiment at the outbreak of war, the North Yorkshire tailor’s son fought in Gallipoli alongside his younger brother, John, who was killed during an assault. 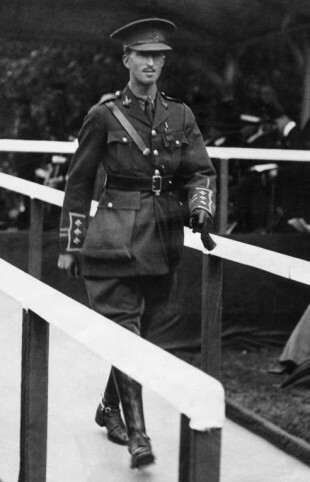 Archie was Mentioned in Despatches and wounded twice, and, after being promoted to brigade major in 1918, he was awarded the Military Cross for distinguished active service. After the war, he married and had three daughters and served in numerous senior military positions, including chief education officer 21st Army Group. In 1945, he was recognised for further bravery, before retiring from the Army in 1947 as an honorary colonel. Following an academic career, he died aged 80, in 1971. Speaking after the ceremony, his eldest great grandson, Rory Baird, said he had been aware of his relative’s valour since he was young. His father had taken him to the Green Howards Regimental Museum, in Richmond, to see the medals and said he would take his son there when he was older. Mr Baird said that while his family was proud of Archie, they also remembered the actions of “the generation of Britons who gave their lives for the country”. He said: “Some of his grandchildren were at the ceremony and the family thought it was a wonderful occasion to mark the anniversary.